Used the digital level and rigged the elevator for travel and angles. Riveted the final rivets in the flaperon control horns and hinges and then rigged them with the flaperon holders I made of wood a while ago. Took a little while but it should be right on. I was able to close up the floor boards and get ready to install the interior fabric and flooring over the wood. I cut the turtledeck in half and installed the plastic hinge with two pieces of angle aluminum to give it strength. I have to cut the ends down some befor I can install it on the aircraft and put the clecos in. 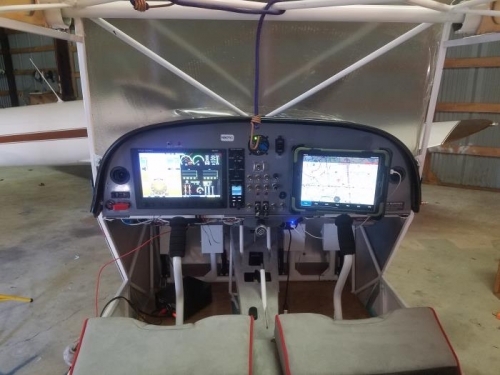 Put the tablet mount on the instrument panel and fired up the tablet for a picture. I need to get some pictures of the turtledeck and put them here tomorrow. Getting close.